“‘Tis not seasonable to call a man a traitor that has an army at his heels.” John Selden (1584-1654), British jurist, statesman. “Traitor,” Table Talk (1686). We pride ourselves with our regionalistic inclinations. We identify ourselves with our friends, relatives, and neighbours. And we find ourselves more in common with our kababayan. Our townmates, provincemates, and yes, our cabalens, kabayans, kasagpi, kauragon, etc., are our extended primos. Especially when we speak the same dialect. Ferdinand Marcos was the pride of the Ilocandia. The Osmenas, the Visayans. The Laurels, the Batanguenos. Diosdado Macapagal, his cabalens from Pampanga. FVR, the Pangalatoks. Now here comes Raul Roco, the unmistakeable rocket of Bicolandia. “Sain ka maduman, Raul Roco?” Quo vadis, Raul ? What happened to your kababayans? Why are they forsaking you? It came as a shock when the governor of Camarines Sur where Roco comes from, being its erstwhile congressman for two terms, has spoken in behalf of the six governors from the Bicol Region that they are, to a man, a believer of Danding Cojuangco. When asked why he’s supporting Cojuangco, Gov. 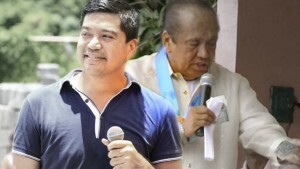 Villafuerte said, “We’d rather support a non-Bicolano. Raul Roco does not deserve our support.” That came as a bolt from the blue. How do the Bicolanos react to that declaration? Do these governors, with their much vaunted political machinery, have the capacity to elect Danding as President? Bicolanos unite! This is the best time to change your governors! These elected officials are blind to the aspirations of their constituencies. For almost a century, the Bicolanos have patiently waited that one of them would some day occupy Malacanang. Tecla San Andres Ziga was the region’s first senator. And there were others after her. Louie Villafuerte was once a top Bicolano honcho, who had the ear of Marcos. With the dictator around and his first family and the other military and cabinet heavyweights, Villafuerte contented himself as just like that. Those governors not only have they announced their treachery; they have made known their intention to tear down. For in a political contest, what else will they do to Roco since they have proclaimed already their preference to his most likely opponent? “There is no substitute for victory,” claimed Carlos Romulo. Expect therefore the wrecking crew of these local chiefs training their guns towards Roco’s direction. What, on the other hand, if Roco wins? Where shall we pick up those governors? Hence, they have unnecessarily burdened themselves by campaigning for whoever is Roco’s opponent just to ensure that Roco doesn’t make it. This is crab mentality at its best. It was a sorry sight, these governors and local leaders humouring Cojuangco as he alighted from his Lear Jet. They were grinning from ear to ear, introducing Danding to their drivers, gofers, and factotums. “Boss,” they chorused, “where we’re going there’d they go!” While Danding was strutting naked in Naga City, these low lifes were one in saying, “Boss, what a fine outfit you have.” What about the 5,000 well-wishers? Danding is familiar with the hakot-system; in fact, he might even be its inventor. It was even more pathetic for a Visayan congressman to boast, when he was waving the written signatures of 70 congressmen who expressed their support to GMA, claiming that easily each one of them could deliver 50,000 votes. Whose leg was he pulling? Has he not heard of the fate of Ramon Mitra who had the legendary backing of the entire Congress in his run for the Presidency in 1992? This is not lost to Danding, and as we said, this is the cause of his deep misery. As a sabungero, he knows that his Kristos are two-faced freeloaders. This early, the Bicolanos have already made their decisions. In their various Capitolios come July, 2004, there’ll be new tenants, certainly not the six stooges who betrayed their kauragon. There is a little known fact about Raul Roco, when on July 31, 1987, he was haled by the Presidential Commission on Good Government, together with TEODORO R. REGALA, EDGARDO J. ANGARA, AVELINO V. CRUZ, JOSE C. CONCEPCION, ROGELIO A. VINLUAN, VICTOR P. LAZATIN and EDUARDO U. ESCUETA, before the Sandiganbayan for the recovery of ill gotten wealth as co-principals with Eduardo Cojuangco. Defendants Eduardo Cojuangco, Jr., Edgardo J. Angara, Jose C. Concepcion, Teodoro Regala, Avelino V. Cruz, Rogelio A. Vinluan, Eduardo U. Escueta, Paraja G. Hayudini and Raul Roco of the Angara Concepcion Cruz Regala and Abello law offices (ACCRA) plotted, devised, schemed conspired and confederated with each other in setting up, through the use of the coconut levy funds, the financial and corporate framework and structures that led to the establishment of UCPB, UNICOM, COCOLIFE, COCOMARK, CIC, and more than twenty other coconut levy funded corporations, including the acquisition of San Miguel Corporation shares and its institutionalization through presidential directives of the coconut monopoly. Through insidious means and machinations, ACCRA, being the wholly-owned investment arm, ACCRA Investments Corporation, became the holder of approximately fifteen million shares representing roughly 3.3% of the total outstanding capital stock of UCPB as of 31 March 1987. This ranks ACCRA Investments Corporation number 44 among the top 100 biggest stockholders of UCPB which has approximately 1,400,000 shareholders. On the other hand, corporate books show the name Edgardo J. Angara as holding approximately 3,744 shares as of February, 1984. Raul Roco, true to his self, opted to divulge his principals in the transaction and offered to present the pertinent papers and documents in support thereof, particularly, (a) the disclosure of the identity of his clients; (b) submission of documents substantiating the lawyer-client relationship; and (c) the submission of the deeds of assignments petitioners executed in favor of his client covering their respective shareholdings. The ACCRA lawyers asked the Supreme Court to drop them as well, and slug it out before the high court, without making any disclosure, on the strength of lawyer-client privelege. “Where the communicated information, which clearly falls within the privilege, would suggest possible criminal activity but there would be not much in the information known to the prosecution which would sustain a charge except that revealing the name of the client would open up other privileged information which would substantiate the prosecution’s suspicions, then the client’s identity is so inextricably linked to the subject matter itself that it falls within the protection. The Baird exception, applicable to the instant case, is consonant with the principal policy behind the privilege, i.e., that for the purpose of promoting freedom of consultation of legal advisors by clients, apprehension of compelled disclosure from attorneys must be eliminated. This exception has likewise been sustained in In re Grand Jury Proceedings 51 and Tillotson v. Boughner. What these cases unanimously seek to avoid is the exploitation of the general rule in what may amount to a fishing expedition by the prosecution. “There are, after all, alternative source of information available to the prosecutor which do not depend on utilizing a defendant’s counsel as a convenient and readily available source of information in the building of a case against the latter. Compelling disclosure of the client’s name in circumstances such as the one which exists in the case at bench amounts to sanctioning fishing expeditions by lazy prosecutors and litigants which we cannot and will not countenance. When the nature of the transaction would be revealed by disclosure of an attorney’s retainer, such retainer is obviously protected by the privilege. 53 It follows that petitioner attorneys in the instant case owe their client(s) a duty and an obligation not to disclose the latter’s identity which in turn requires them to invoke the privilege. “In fine, the crux of petitioners’ objections ultimately hinges on their expectation that if the prosecution has a case against their clients, the latter’s case should be built upon evidence painstakingly gathered by them from their own sources and not from compelled testimony requiring them to reveal the name of their clients, information which unavoidably reveals much about the nature of the transaction which may or may not be illegal. The logical nexus between name and nature of transaction is so intimate in this case the it would be difficult to simply dissociate one from the other. In this sense, the name is as much “communication” as information revealed directly about the transaction in question itself, a communication which is clearly and distinctly privileged. A lawyer cannot reveal such communication without exposing himself to charges of violating a principle which forms the bulwark of the entire attorney-client relationship. “I respectfully submit that the attorney-client privilege is not a magic mantra whose invocation will ipso facto and ipso jure drape he who invokes it with its protection. Plainly put, it is not enough to assert the privilege. The person claiming the privilege or its exceptions has the obligation to present the underlying facts demonstrating the existence of the privilege. When these facts can be presented only by revealing the very information sought to be protected by the privilege, the procedure is for the lawyer to move for an inspection of the evidence in an in camera hearing. The hearing can even be in camera and ex-parte. Thus, it has been held that “a well-recognized means for an attorney to demonstrate the existence of an exception to the general rule, while simultaneously preserving confidentiality of the identity of his client, is to move the court for an in camera ex-parte hearing. Without the proofs adduced in these in camera hearings, the Court has no factual basis to determine whether petitioners fall within any of the exceptions to the general rule. Raul died unburdened by the temporal lawyer’s obbligato of perchance felon representation. Upon meeting his Creator, Raul only needs his own able counsel.